Sun Shipbuilding, Chester, Pa., has received a shipbuilding order for two 30,000-deadweight-ton product tankers from Sun Trad- ing and Marine Transport, Inc., a Sun Company subsidiary. The shipyard is moving rapidly ahead on the design and engineer- ing of the two 612-foot tankers in preparation for keel-layings later this year. Delivery of the first of the two vessels is tentatively scheduled for 1979. Department of the Port Authority of New York and New Jersey. The following items are among the major findings of the study: • The U.S.-flag merchant fleet accounts for total sales of $8.3- billion annually, and its activities create and maintain 244,900 jobs throughout the nation. This gen- erates personal incomes of $2.4 billion, and corporate incomes of $0.8 billion. • The American shipbuilding industry has a total annual out- put of $6 billion, and generates 235,400 jobs in this country. Per- sonal incomes generated through- out the economy by. this industry total $2 billion; corporate incomes total $0.6 billion. The privately owned and operated U.S. mer- chant marine is responsible for one-third of the shipbuilding in- dustry's activities. • Operating- and construction- differential subsidies are respon- sible for a combined total output of $2.5 billion in the national economy, and 88,500 jobs on ships and ashore. The subsidies gener- ate personal incomes totaling $0.9 billion, and corporate incomes to- taling $0.2 billion. • From one-third to one-half of the total costs of the subsidy pro- grams are recovered by the U.S.
March 1, 1978 23 activities of subsidized vessel op- erations and construction. The study used an Input-Output (I-O) Model to measure the im- pact of the maritime industries on the economy. The model makes it possible to measure the inter- actions not only between produc- ers and final consumers, but also among the industries. The 1-0 Model revealed that through the chain of purchases initiated by maritime activities, the output of the U.S.-flag mer- chant fleet has a "multiplier ef- fect" of 1.8, meaning that each dollar of sales produces a total output of $1.80 in sales through- out the economy. The multiplier for the American shipbuilding in- dustry has an even higher rating of 2.1. Model were from 1970, the latest year for which complete input- output data were available. In 1976 dollars (adjusted for infla- tion), the figures for shipping would be higher by 36 percent, and the figures for shipbuilding would be higher by 44 percent. Springfield, Va. 22161. The price is $10.75 and the order number is PB-272518/AS. Never before has there been a marine navigation system so useful, so easy to oper- ate, and so reliable. Navigator is the first commercially available satnav system to em- ploy a microprocessor, the computer on a chip. MX 1102-NV brings a new high performance level to all-weather satellite navigation. Here's why: tomatic or manual. Even set and drift are computed and applied automatically. Magnavox Government MV and Industrial Electronics Company. The system functions automatically through- out the voyage. It computes and displays ship's posi- tion to within 0.1 NM using signals from six orbit- ing satellites. You need never touch it except to enter two-digit number codes on the keyboard to call up special informa- tion on the display. You can learn to use it in a couple of hours. With di- rect readout of latitude and longitude, there's no need for special charts or manual computations. The MX 1102-NV has met rigorous requirements for DNV Class Nav N approval. Nothing has been overlooked to ensure zero defects performance, from the use of high reliability components, environmental testing, factory burn-in testing, and finally months-long tests at sea. Automatic self-test isolates any fault down to the circuit module level for quick at-sea replacement. Self-contained battery power takes over and an alarm notifies the operator when main power fails, with no loss of system function. Culmination of \fears of Experience. 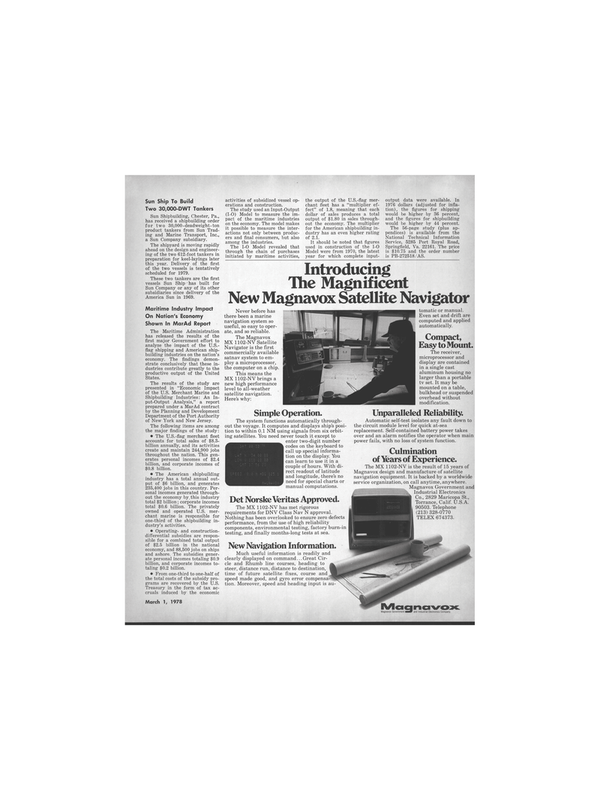 Magnavox design and manufacture of satellite navigation equipment. It is backed by a worldwide service organization, on call anytime, anywhere.